Can we reduce protein loss in alfalfa by introducing traits from red clover? Alfalfa (Medicago sativa L.) is often referred to as the “Queen of Forages” due to its relatively good digestibility, high protein, and ability to readily fix nitrogen. As a result of fixing nitrogen, the protein produced by alfalfa should have a high economic return in dairy systems because minimal outside inputs are required to produce it (i.e., no expensive nitrogen-based fertilizers). However, this assumes that the dairy cow can efficiently capture the protein produced by alfalfa. 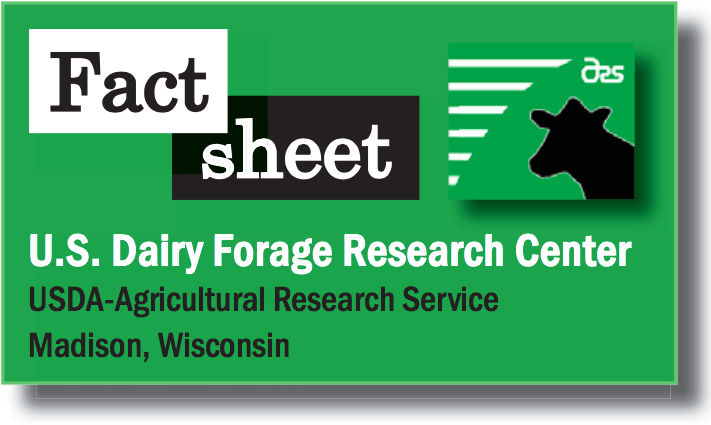 Vegetative proteins of forages like alfalfa are rapidly degraded in the rumen of dairy cows and are not efficiently utilized to capture all of their potential nutritional and economic value. Protein fragments (partially degraded protein molecules) are even less efficiently utilized . . . resulting in a need for additional protein additives in the diet . . . resulting in additional nitrogen waste in manure. It is critical that a large amount of the forage protein is preserved as “true protein” as it goes into the dairy diet. This becomes a challenge in the more humid U.S. agricultural producing regions that ensile alfalfa forage. Why? Because during the ensiling process, plant proteases are released and they begin degrading the vegetative proteins even before they are fed. This is one reason ensiling practices emphasize the need to rapidly decrease silage pH to a point that it limits protease activity and stops protein degradation. Variable and changing environmental conditions often lead to the production of less than optimal silage; protein degradation may be as high as 70 to 75% of the true protein. An exception to this often-observed problem with alfalfa and other forages, including corn silage, is red clover. Red clover, even under poor ensiling conditions, typically has minimal protein degradation, maintaining 70-80% of its protein intact; providing more true protein in the diet; and resulting in higher protein use efficiencies. The key factor in red clover is an enzyme called polyphenol oxidase (PPO) and an abundance of its substrate, special chemicals called o-diphenols. PPO converts the o-diphenols to o-quinones which are highly reactive molecules that can bind to proteins. These o-quinones react with the native proteases decreasing their activity and leave much of the protein intact during the ensiling process. 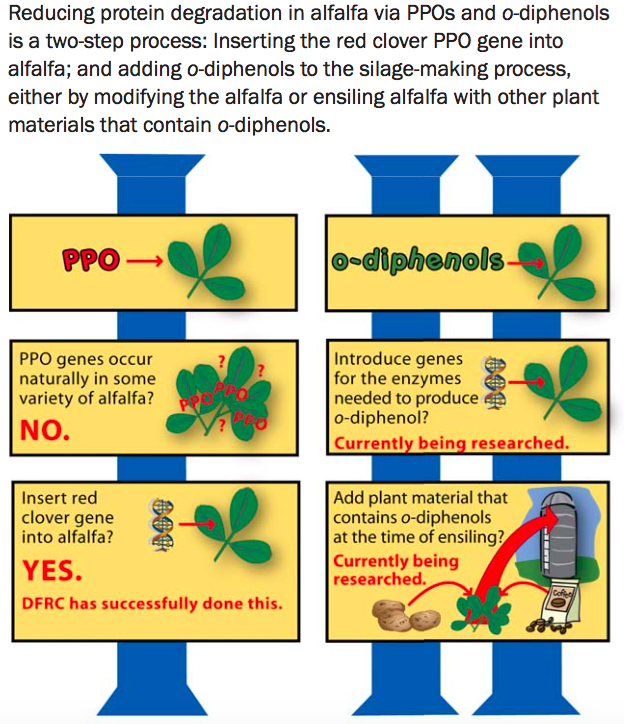 The question is, “Can the PPO system that works so well in red clover be transferred to alfalfa?” To fully develop a PPO/o-diphenol system in alfalfa requires two new components to be introduced into alfalfa: an active PPO enzyme and the o-diphenols it needs as substrate to produce the critical o-quinones. An extensive survey of alfalfa germplasm indicated that there were no natural variants that contained active PPO in the vegetative portions of the plant. Therefore, a precision breeding approach was used here at the U.S. Dairy Forage Research Center to insert the red clover PPO gene into alfalfa. The first step of this process has been quite successful and alfalfa plants expressing the red clover gene can inhibit proteolytic activity when appropriate o-diphenols are added as a substrate. The next step of this process is to have a supply of o-diphenols since alfalfa currently does not produce such PPO substrates. Of course, the most desirable approach would be to have alfalfa synthesize the appropriate o-diphenol substrate. We are currently working on ways to introduce the necessary genes for the enzymes needed to produce a suitable o-diphenol. An alternative approach would be to use external sources of diphenols that are abundant in many plants such as potato peels, coffee grounds, and forages like timothy. We are also working to test the feasibility of co-ensiling PPO-forage with plant materials or plant extracts that contain o-diphenols to decrease proteolytic activity and preserve the greatest possible amount of the native protein as intact protein. This work with red clover PPO and using the gene to modify alfalfa clearly indicates a feasible strategy for decreasing excessive protein degradation during the ensiling of alfalfa. Such improvements would have direct economic benefits to the farmer as well as positive impacts upon the environment. It may be a way to put a bit more luster in the Queen’s crown.